I haven't made any code changes since last Tuesday. I played through an entire season on Champ difficulty with the worst team (Maine Lobsters). I went 5-10, which is what I was hoping for, roughly. Every sports game with a Franchise mode, if it works, will force the gamer to build his team via the offseason before it can compete for a championship. I wanted to make sure that a similar path existed in GS, and it does. I won two games on the last play, and lost one on the last play as well. My wins were nail-biters. So were some of my losses, but I got blown out a few times because I gave in to temptation and burned through my Big Play presses on defense early in a half. Over the course of the season, the only hiccup I had was one sound effect not playing one time. The Steam Greenlight campaign is chugging along here, but clearly, it's a long and still unlikely process. So on the Monday after Thanksgiving, I'm going to submit to Desura. I didn't balance development and marketing well, because it was so hard to tell when development was nearly over, plus all this marketing stuff is totally new to me, and very much against my basic nature. Having said that, though, I've reached out to a few people and hope to have a little coverage this week. The Big Play button was in the original game design, and so were the text events that might be triggered when you use it. I wanted the basic card play to be riskless, but to force the player to take risk via the Big Play button to be able to win the game. 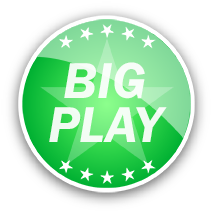 So on any single play, you might not need the Big Play button, but in order to win the game, it has to be used. Because of the natural variability of the cards, games play out so differently that there's no single optimal strategy. There is one guiding principle, though: take no more risk than is necessary. What this means is that when you're ahead and it's late, you'll be less willing to take chances. This mirrors real football strategy, which is good, but it's also a mechanism that tends to keep games close (and tense). I've been consistently surprised by how close the games are, but it makes sense if you look at the risk profile. I'm much less willing to assume risk when I'm ahead by more than one score, which tends to lead to a natural tightening of the score by the end of the game. I didn't consciously put this into the game design. The idea that the player had to assume risk was definitely there, but not the realization that it would help keep games close and exciting.